Coral reefs — a key element in ocean ecosystems that provide not only coastline protection but billions of dollars in benefits from tourism, as well as ingredients used in cutting-edge medicines — are increasingly threatened from the effects of global warming and other hazards, according to a new U.S. government report. “It’s a pretty alarming situation,” said Jeannette Waddell, the report’s co-editor and a marine biologist with the National Oceanic and Atmospheric Administration’s National Ocean Service. “Coral reefs around the world are confronted by the same types of threats. In some places it is worse. In some places, it’s slightly better. But we’re finding that even remote reefs are showing signs of decline,” she told ABC News. The NOAA report looked at the health of coral reefs in 15 areas under the jurisdiction of the United States and a group of countries called the Pacific Freely Associated States, which include Palau, the Marshall Islands and Micronesia. A major threat facing corals is climate change, the report says, which affects coral reefs in multiple ways. “It really stresses out the coral and makes them more susceptible to things like disease,” Waddell said. A major bleaching and disease event in 2005 devastated coral reefs across the Caribbean. In the U.S. Virgin Islands and Puerto Rico, scientists say an average of 50 percent of the coral was lost. Some areas lost 90 percent of their coral. Another problem for corals is that human-induced climate change is altering the chemistry of the oceans, making them more acidic. It happens as fossil fuels are burned, releasing carbon dioxide into the atmosphere. Much of that carbon dioxide is absorbed by the ocean, which becomes more corrosive. A 1997 report in the science journal Nature estimated that the resources and economic benefits derived from coral reefs are worth $375 billion a year. “Coral reefs only cover about one percent of the world’s surface, but they are a very diverse and important environment or ecosystem,” said Mark Monaco, a marine biologist with NOAA’s National Centers for Coastal Ocean Science. “They provide us fisheries, they provide us culture from the cultural resources, they provide us pharmaceuticals, and they provide us protection from storm events,” he told ABC News. In areas that have been hit by severe tsunamis, experts point out that damage is usually less severe in places with intact coral reefs just offshore. Scientists who study the medical benefits of coral reefs say there are about 20 compounds in clinical trials derived from the corals themselves or the many organisms that depend on them. “That biodiversity is holding the key to treatment of diseases current and future,” said William Gerwick, a professor of oceanography and pharmaceutical sciences who holds a dual appointment at the Scripps Institute of Oceanography and the University of California San Diego Skaggs School of Pharmacy and Pharmaceutical Sciences. “As we disturb that biodiversity, and reduce the species’ richness, we change that equation dramatically,” said Gerwick, who was not involved in the NOAA report. Gerwick points to a drug compound derived from a species of sea squirt — small, colorful organisms that live on coral reefs — that has been approved by the European Union for treating soft tissue cancers. The drug, marketed under the name Yondelis in Europe, is in clinical trials in the United States. Some corals have recently gotten better protections from the federal government. In 2006, two coral species were designated as “threatened” under the Endangered Species Act. Climate change isn’t the only threat to coral reefs. Tropical storms, coastal pollution, even boats and their anchors are serious concerns. “The declining conditions that we’re seeing is exacerbated by having a number of threats work together to cause the decline,” Waddell said. The report — the work of 270 contributors — is being presented today at the International Coral Reef Symposium in Fort Lauderdale, Fla.
Probing the salamander genome reveals clues to its remarkable ability to regrow damaged limbs and organs. 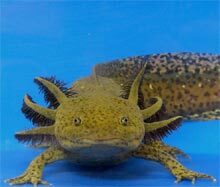 In its own way, the axolotl salamander is a mighty beast. Chop off its leg, and the gilled creature will grow a new one. Freeze part of its heart, and the organ will form anew. Carve out half of its brain, and six months later, another half will have sprouted in its place. “You can do anything to it except kill it, and it will regenerate,” says Gerald Pao, a postdoctoral researcher at the Salk Institute for Biological Studies, in La Jolla, CA. That extraordinary power of regeneration inspired Pao to probe the axolotl salamander’s DNA. Despite decades of research on the salamander, little is known about its genome. That began to change last year, when Pao and his collaborators won one billion bases’ worth of free sequencing from Roche Applied Science, based in Indianapolis. Now that the data is in, scientists can finally begin the hunt for the genetic program that endows the animal with its unique capabilities. While all animals can regenerate tissue to a certain extent–we can grow muscle, bone, and nerves, for example–salamanders and newts are the only vertebrates that can grow entire organs and replacement limbs as adults. When a leg is lost to injury, cells near the wound begin to dedifferentiate, losing the specialized characteristics that made them a muscle cell or bone cell. These cells then replicate and form a limb bud, or blastema, which goes on to grow a limb the same way that it forms during normal development. Scientists have identified some of the molecular signals that play a key role in the process, but the genetic blueprint that underlies regeneration remains unknown. Researchers hope that by uncovering these molecular tricks, they can ultimately apply them to humans to regrow damaged heart or brain tissue, and maybe even grow new limbs. In order to quickly identify sections of the salamander’s genome involved in regeneration, the scientists sequenced genes that were most highly expressed during limb-bud formation and growth. They found that at least 10,000 genes were transcribed during regeneration. Approximately 9,000 of those seem to have related human versions, but there appear to be a few thousand more that don’t resemble known genes. “We think many of them are genes that evolved uniquely in salamanders to help with this process,” says Randal Voss, a biologist at the University of Kentucky, who is working on the project. The researchers now plan to make a gene chip designed to detect levels of some of these candidate genes, so that the scientists can determine at exactly what point during the regeneration process the genes are turned on. The team is also developing molecular tools that allow them to silence specific genes, which will enable them to pinpoint those that are crucial for proper regrowth. The extra DNA sequences sit within genes and are cut out during the translation from gene to protein. Much of this DNA comprises repetitive sequences not found in any other organisms to date, says Pao. However, it’s not yet clear whether these repetitive stretches help facilitate regeneration or play some other role in the salamander’s life cycle.